and updates from the Cosmic JS team. 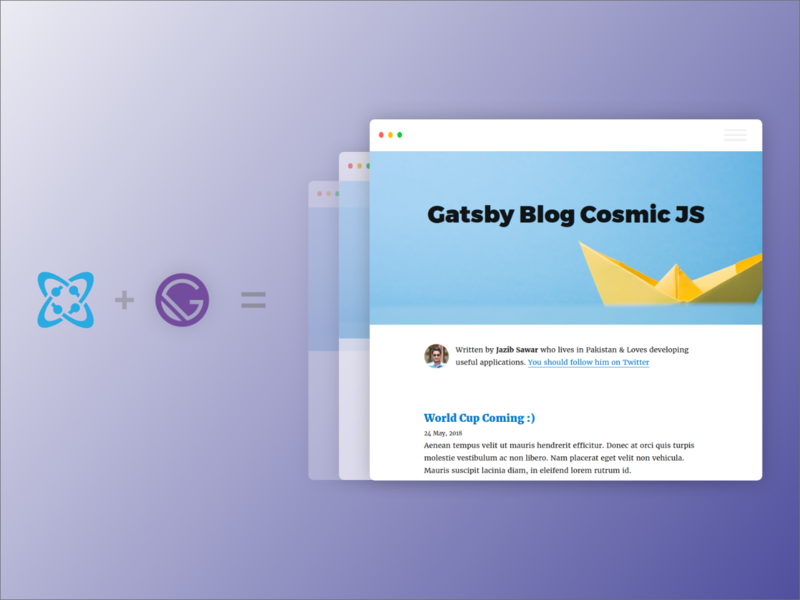 Since debuting the Cosmic JS Gatsby Source Plugin and Cosmic-powered Gatsby Blog earlier this summer, it's been one of the most popular applications in the Cosmic JS Apps Marketplace. Taking the hint that the Cosmic JS Community was crazy for Gatsby, we made the Gatsby Starter App available, which lets you install a Cosmic-powered Gatsby app in seconds. With all the recent Gatsby fervor, we were delighted to get to sit down with Kyle Mathews, founder of Gatsby and a software engineer living in San Francisco. Follow Kyle on GitHub and Twitter, and enjoy the Q/A. Cosmic JS: How long have you been building software? Kyle: My oldest brother is a programmer and tried introducing me to qbasic when I was 10 or something. I thought it was kinda interesting but it didn't stick. I did a lot of video editing and animation in high school but I didn't program program until my sophomore year in college when I took an intro to programming class and got hooked. This led to a bunch of web projects then a startup project my last year of college and then haven't stopped since. What is your preferred development stack? What past projects are you most proud of and why? Pre-Gatsby — I worked at a startup called Pantheon. It was my first "real" job and first time working with a great engineering & product team and I'm really proud of the work I did there building out their dashboard tools. These days of course I'm working full-time on Gatsby — which I'm super proud of. It's been really fun to design & build something lots of people love and even more—to see it gradually become other people's project and passion—not just mine. Talk a little bit more about your process for building apps. I like to think about things fairly thoroughly before working on them. Try to jump through every requirement users could ever have for the project. How that'd impact the UI and the technical side of things, etc. And then try to forget about all that and figure out the tiniest part of it I can build and ship immediately aka the MVP. Doing that is tricky but it helps avoid coding yourself in corners by not anticipating a big requirement but also to avoid spending lots of time solving problems that turn out to not actually be problems. When you get the balance right, you can solve some small part of the problem very quickly which will help you get a lot of great feedback from excited users and that feedback and energy combined with your foreseeing what will be needed will enable you to iterate on the rest of the problem very very quickly. What are some technologies you are excited about that you are using today, or want to learn more about? What problems are Gatsby solving in the future? What is the plan of growth? So many! We want to ensure that whatever you build with Gatsby will always be lightning quick and that development will be fun and fast. We're up to 930 total contributors to the project are merging literally 100s of PRs a month. We're working on ways to scale our OSS maintenance with the growth of the community so more automation and helping more people grow their contribution to Gatsby. So no shortage of things to do :-) We're very energized by the enthusiasm from the community and are excited to keep pushing forward the experience of building sites with Gatsby. Join the conversation on Twitter and Slack. In this installment of the Cosmic JS Developer Spotlight Series, we sat down with Raymond Camden, a Senior Software Engineer and Developer Advocate residing in Lafayette, Louisiana. Raymond has extensive experience in the technology space, having enjoyed stints at IBM, Adobe and AuthO prior to becoming a Senior Engineer for Developer Experience at American Express. Follow Raymond on Twitter, GitHub or LinkedIn, and enjoy the Q/A. Cosmic JS has allowed us to enter the market quicker. We managed to build a Proof of Concept and deploy it within one week thanks to the well-documented APIs and easy-to-use User Interface for our Content Editors. In this installment of the Cosmic JS Developer Spotlight Series, we sat down with Emma Wedekind, a developer and New York native now residing in Karlsruhe, Germany. Emma is a Software Engineer at LogMeIn and the Founder of CodingCoach.io. Follow Emma on Twitter, LinkedIn or Medium, and enjoy the Q/A. A new Developer Hero joins us in our latest installment of the Cosmic JS Developer Spotlight Series. We sat down with Brian Mullis, a developer in Portland who lead the charge on innovative app development for his interactive agency. The Developer Hero returns in this latest installment of the Cosmic JS Developer Spotlight Series.